A cracker-thin crust holds together the plentiful toppings on this chicken, pesto, spinach and feta pizza. Sometimes dining out should be an adventure that’s not just about the taste of the food but also the flavor of the environment. 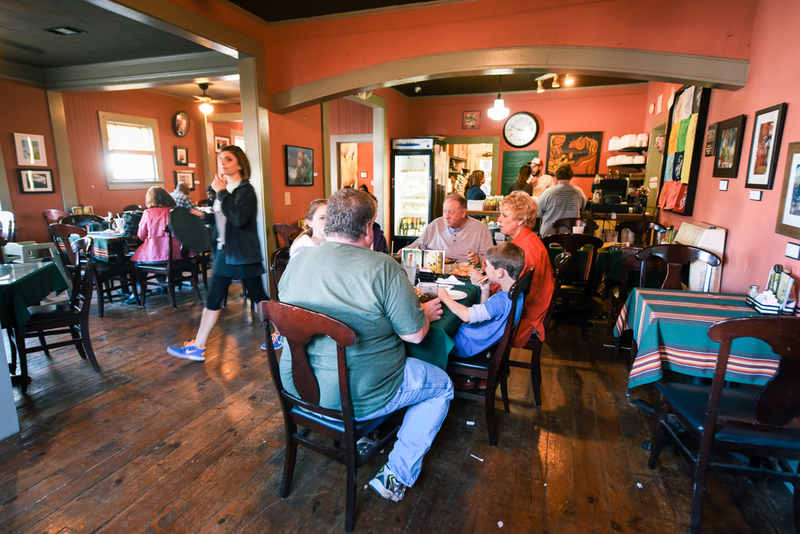 That’s especially true at Magnolia Café in nearby St. Francisville. The café is just part of the draw. You can extend the adventure by catching a local/regional band at the restaurant most Fridays, slumbering in 3-V Tourist Court’s vintage cabins, and awaking to coffee and breakfast at Birdman Coffee and Books (another spot for local music). All are within walking distance of each other across a shady gravel lot in St. Francisville—an easy drive from Baton Rouge. 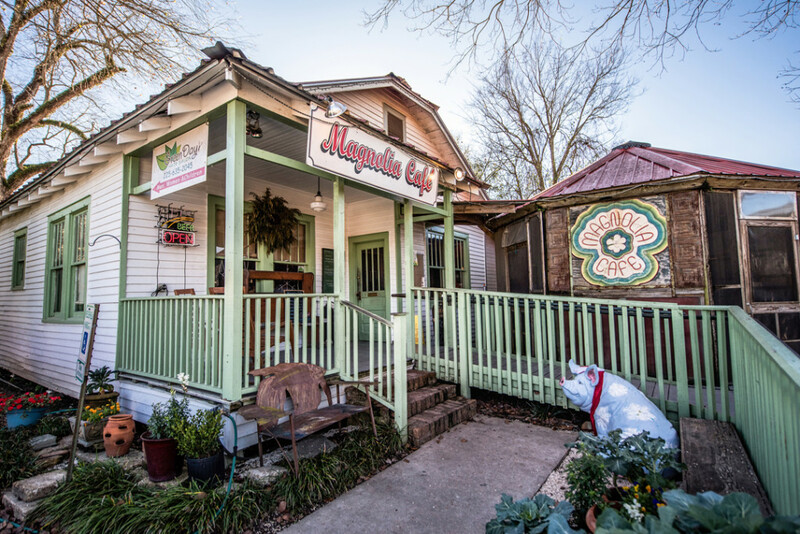 Like a hodgepodge of houses linked together, Magnolia Café provides several dining spaces for guests. On the Friday we visited, the joint was jumpin’ with music on the patio. The evening had turned cool, but the porch was warm with the ceiling heaters going. The atmosphere was lively, with couples and kids dancing around the stage. Our server helped us navigate the menu that moves from incongruent appetizers to Mexican cuisine, pizza, seafood and beef options. The menu may seem disconnected, but it’s as eclectic as the space. At our server’s suggestion we ordered homemade guacamole with pita as a starter along with a chicken, pesto, spinach and feta pizza and seafood enchilada. 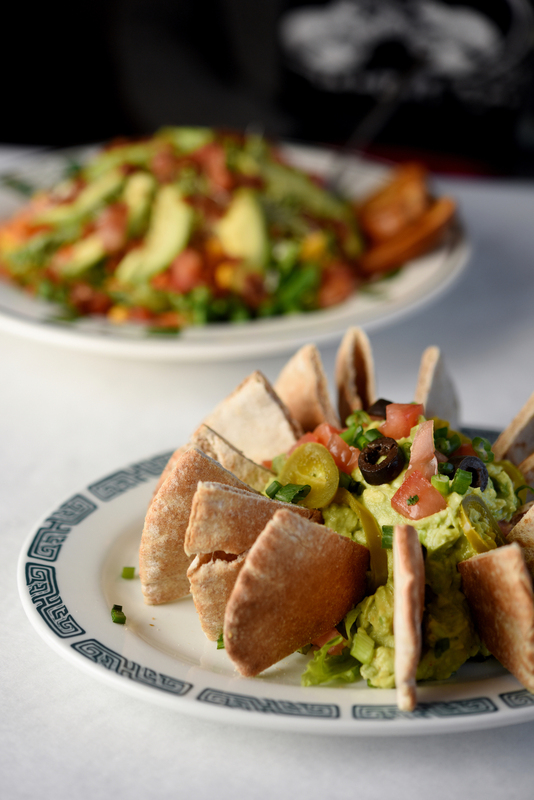 The large scoop of creamy guacamole arrived with warm pita—a nice contrast to the typical tortilla chips. No sooner had we tasted the guacamole than our pizza and enchilada arrived. I couldn’t resist a quick nibble of the sliced chicken on the pizza and was blown away by the juicy marinated flavor and bountifulness. The cracker-thin crust was a sturdy foil to the large amount of toppings. Fresh and light, the pesto base and sautéed spinach were a welcome change to the usual meat and tomato sauce pizza. While I picked at the pizza, my partner attacked the enchilada. Served with lackluster beans but spicy Mexican rice, the enchilada could barely be seen beneath the melted cheeses. My partner noted, “You certainly can’t complain about a lack of cheese.” Once I maneuvered past all that cheese, the shrimp and crawfish spilled out of the flour tortilla. A dollop of the guacamole added smoothness and further flavor to this gratifying dish. 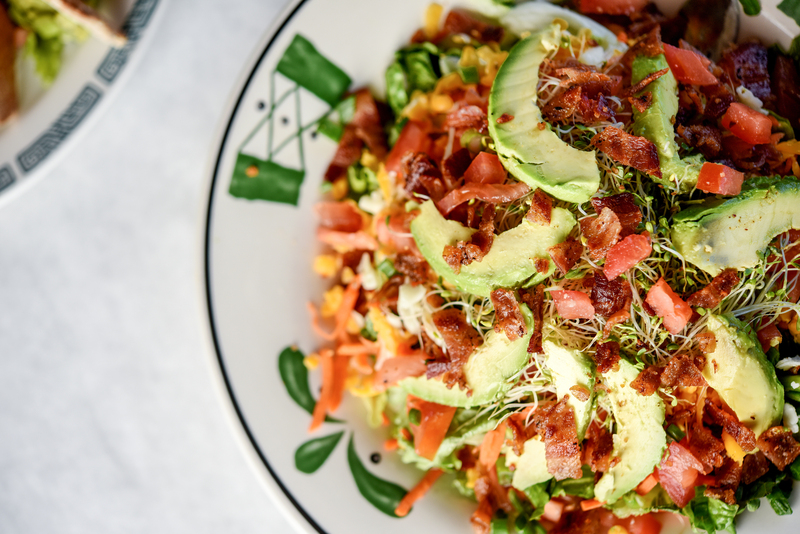 The hefty Magnolia House Salad with avocado, bacon, carrots, sprouts and more. From our vantage point, we saw myriad other dishes go by. The pork chops smelled divine, the salads looked hearty and the fried seafood seemed well prepared. For dessert, I had spied a layer cake but our server advised the bread pudding was exceptional. Unfortunately, it was sold out. So in addition to the cake, he brought us a sliver of the also recommended bourbon pecan pie. Lacking neither booze nor nuts, it was pleasingly sweet with a flaky homemade crust. 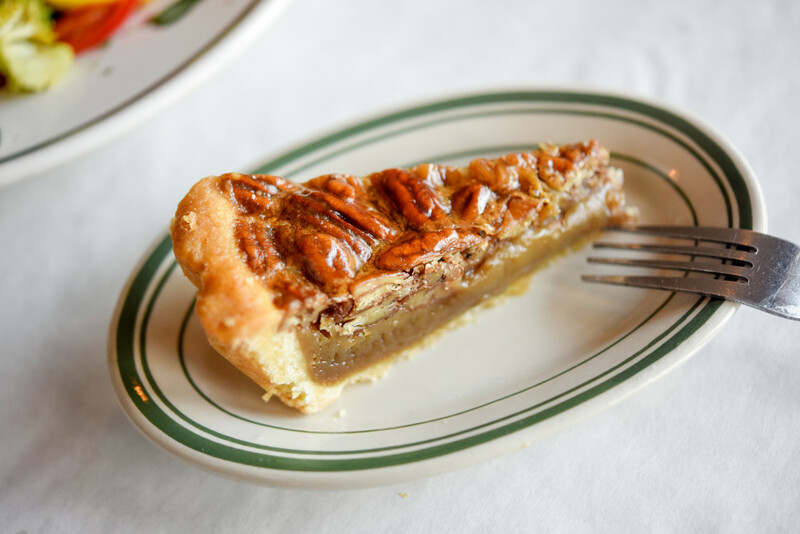 A traditional bourbon pecan pie with a flaky homemade crust. The strawberry/blueberry cake that initially caught my eye sadly did not capture my taste buds. It wasn’t bad and the texture was interesting, but the berries muddled the flavors. This is an establishment with obvious repeat customers, and everyone appeared to know someone. Yet we never felt like outsiders and were welcomed by all of the staff. Speaking of welcome, breakfast the next morning at Birdman had us feeling like locals in no time. Discussions of the day’s news, travel and general gossip made for a pleasurable start to our day. As we strolled back to our cozy room at 3-V, we stopped to chat with other guests, continuing conversations started over breakfast. After packing up, my partner asked if we were checked out. I replied, “Did you leave the key in the lock? If so, then yes. We are ‘checked out.’” Such is the pace at this small-town establishment. There are plenty of dining rooms inside the café to cater to the crowds. 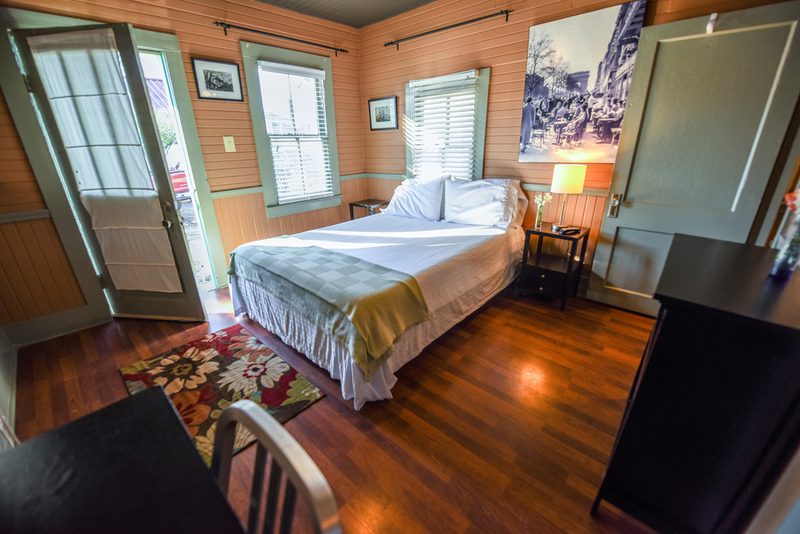 The cozy vintage cabins at the 3-V Tourist Court next door offer a great home base for exploring the town. Lunch daily, 10 a.m.-4 p.m.; dinner Thursday and Saturday until 9 p.m., Friday until 10 p.m.